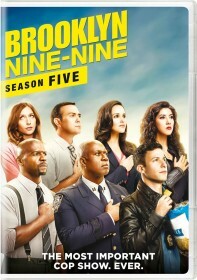 FOX has issued the press release for the December 5 episode of Brooklyn Nine-Nine, 99. As the title suggests, this is the milestone 99th episode of Brooklyn Nine-Nine. While the entire precinct attends a funeral in LA, Holt learns that he is in the running to become Chief Commissioner of the NYPD - his dream job. But after missing their flight back to New York, Jake must devise a variety of ways to get Holt back in time for the interview. Forced to stay with some estranged members of the Boyle family, Amy tries to convince everyone that she can be laid back, Terry panics about losing his first-class flight and Charles uncovers some new information about Rosa's personal life in the all-new "99" milestone 99th episode of BROOKLYN NINE-NINE airing Tuesday, Dec. 5 (9:30-10:00 PM ET/PT) on FOX.